Whenever I cross paths with Sampson Lewkowicz, he is typically in good spirits. I would have to call Lewkowicz, who was born in Uruguay and now resides in Las Vegas, one of the busiest men in the sport due to his obligations stateside and abroad as a matchmaker, advisor, and promoter. Lewkowicz is best known for his work with Argentina’s Sergio Martinez, who endeared himself to fight fans during his run as a blossoming contender and later as middleweight champion of the world. Martinez was soundly defeated by Puerto Rico’s Miguel Cotto last year and decided to call it a career following that defeat. Cotto was destructive vs. Martinez, dropping him three times in the first round and once more in the ninth before Sergio’s trainer Pablo Sarmiento decided to not let his fighter out for the 10th round. 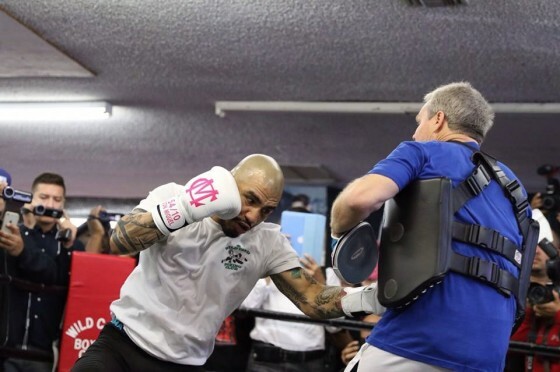 The performance from Cotto spoke volumes about his chemistry with trainer Freddie Roach, as he truly does seem like a fighter with a newfound purpose. Still, as Cotto readies for his Nov. 21 showdown vs. Mexican superstar Saul “Canelo” Alvarez, Lewkowicz has a hard time seeing him defeating his younger rival next weekend. Lewkowicz went on to add that he honestly feels Martinez best days were left inside of the ring with him following his gritty victory over Julio Cesar Chavez Jr. in Sep. of 2012, a fight that saw Martinez survive a knockdown and scare in the 12th round. “After the 12th round [with Chavez], I believe it was the end of his career,” said Lewkowicz of his former fighter. Check below for the full interview with Lewkowicz, including his thoughts on Manny Pacquiao, Floyd Mayweather, and more.